Although based on the local landscapes, his paintings were intended to be more than just strictly topographical, being concerned with the use of colour and composition to create a work of art. The most notable subjective element here is the dramatic changes of scale, with a selective vertical exaggeration of up to six times, producing a Lake District-like landscape and bringing Hornby Castle into prominence - rather than being hardly visible, and a horizontal compression. He also adjusted the positions of various compositional elements, e.g. relationship of foreground birch tree to the bridge behind. His colours show his trademark handling of light, with the early morning sunlight suffusing the work and highlighting Hornby Castle. 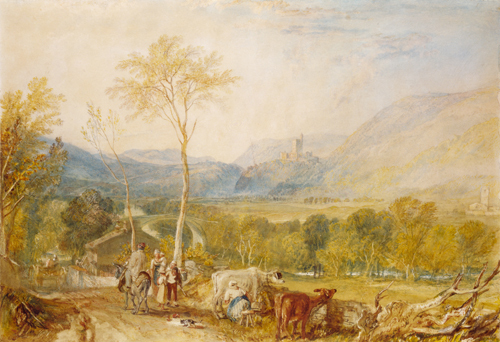 The painting is full of human incident not shown in the sketches and, although scribbles on them refer to various components including an ox in harness, it said that Turner often added such subjects to the paintings from memory. This one has the convincing feel of an image of early nineteenth century rural life in Tatham. It is full of detail: the costumes of the women and children (perhaps the Nelson family, innkeeper in 1819) and of the be-smocked rider; the house-cow hobbled, haltered and blinkered to keep her still and prevent kicking (demonstrably not a castrated male ox! ); the equipment - wood stave bucket, 3-legged stool, crockery pots - one broken to the delight of the cat; the saddle bag & "P" marked saddle cloth of the ancient nag; the 2-wheeled gig (perhaps Turner's transport back to Hornby); the workmen with ladder working on the roof of the next-door cottage. Regrettably, the elegant bridge to the church no longer exists, having been demolished and replaced by an unremarkable one when the river was diverted in 1844 to make room for the railway, which ran along the foreground meadow. 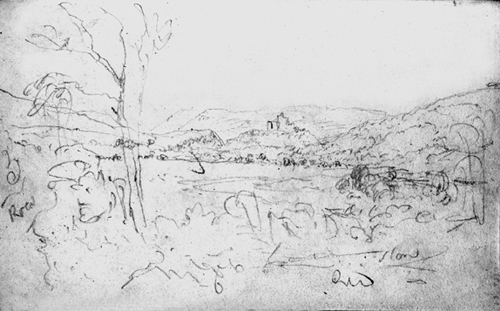 Today, Turner's original view cannot be seen exactly because of a new hedge & bushes along the road.